NASHVILLE, TN— July 19 – Today, the St. Jude Rock ‘n’ Roll Nashville Marathon & 1/2 Marathon is opening registration for the 2017 event, which returns on Saturday, April 29. Nashville’s premiere running event was rebranded as a Rock ‘n’ Roll Marathon in 2016 after having been formerly known as the Country Music Marathon since 2001. The name change aligned with Music City’s diverse foundation that features musical artists spanning all genres. 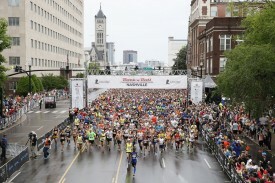 St. Jude Rock ‘n’ Roll Nashville returns with the marathon, half marathon, and 5K. Runners will tour some of Music City’s most notable hot spots and attractions, with spectators lining the course to cheer on participants. The race will once again start in downtown Nashville on Broadway, travel through some of Nashville’s iconic locations such as Belmont University, Music Row and past the Tennessee State Capitol Building and the Country Music Hall of Fame, before finishing at Nissan Stadium, home of the Tennessee Titans. Marathon runners will again get the chance to run through and around the warning track at First Tennessee Park. Registration will open at $65 for the marathon, $55 for the half marathon, $35 for the 5K and $15 for KiDSROCK. The marathon and half marathon prices will increase on July 22. St. Jude Children’s Research Hospital will return as the title partner and official charity of the 2017 St. Jude Rock ‘n’ Roll Nashville Marathon & ½ Marathon. Last year more than 3,000 St. Jude Heroes participated in the race, raising over $2 million for the hospital by securing donations from family, friends and co-workers. Funds raised from St. Jude are instrumental in supporting the $2 million per day it takes to operate the hospital and allows families to never receive a bill from St. Jude for treatment, travel, housing or food. For more information on the event, visit runrocknroll.com and follow St. Jude Rock ‘n’ Roll Nashville Marathon & ½ Marathon on Twitter @RunRocknRoll with hashtag #RnRNashville.